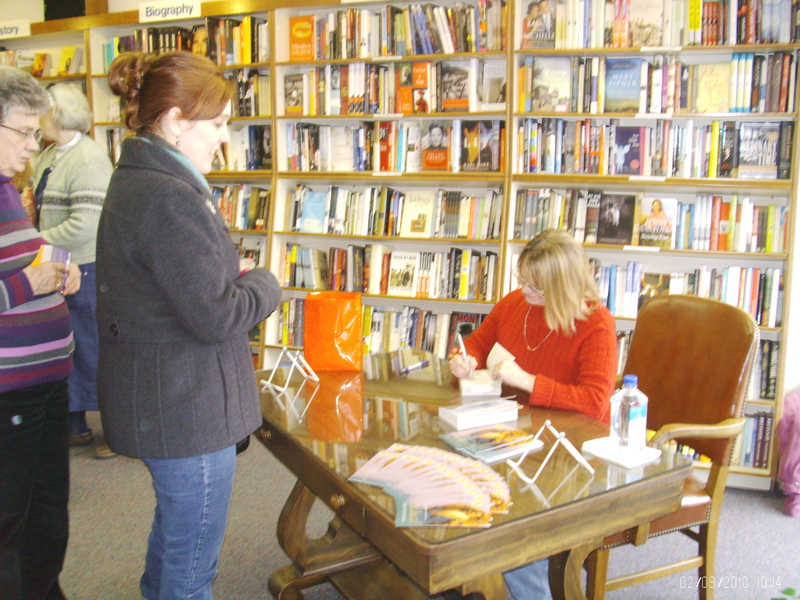 I had a lovely afternoon on Saturday, February 13th, at the Bookworm in Omaha! The Bookworm, an independent bookstore , graciously offered to set up a book signing after I queried them late last year. Manager and part owner Beth Black set up a table and plenty of chairs in a well-lit corner and even provided a much-needed bottle of water for this nervous author. I don’t recall having such a severe case of dry mouth in my life! I hoped Beth wasn’t too optimistic — while I knew several people planned to be there, the chairs outnumbered them. I should have known better! At least half my wonderful critique group came, some with friends or family; so did members of the Heartland Writer’s Group, one of my RWA chapters; and members of my church. I am still touched at the support offered to me by family, friends and colleagues. Cheryl St. John took pictures for me, and even Victoria Alexander stopped to chat with me a few minutes. These are two wonderfully supportive authors! My mentor and president of the Nebraska Writer’s Guild, S. J. Walker, took valuable time out from her horrendous deadline to cheer me on. I did a reading, talked a bit and answered questions without embarrassing myself too much. Meanwhile, the Bookworm sold out of their two dozen copies of To be Seduced! That’s why the stand at my elbow is empty, lol. Pictured with me is Cheri LaClaire, a member of the Heartland Writer’s Group. Yeah, I know — I’m looking down. Really, this is not much of a loss. And I look so industrious! The signing ended (on my part anyway) awash in relief, triumph and a sense of blessings bestowed. Thank you to everyone who attended. I appreciate each and every one of you! I’m lucky I got a book. They SOLD OUT!! Congratulations, Ann! They did, and even bought more, which I autographed. Last I heard, there are only 3 left there. Woot! You did a great job! My daughter was the first one to read your book – I still had RITA enties I was working my way through – just finished them last night – and she enjoyed it a lot. I’m so glad your daughter enjoyed it! I was aiming for a pleasant read with fun characters. And smooches right back!